Ason Technology was established in 2006 in Japan to develop OLED lighting technologies. In November 2013 Ason unveiled their first OLED lighting panel, and today we're bringing new details on the company's technology and business. Ason spent almost eight years to develop a new multi-stack structure. Compared to the multi-photo-emission (MPE) structure developed by IMES, Ason's stack enables many layers (MPE allows up to 2 or 3 max). Stacking several layers allows the OLED panels to feature a high brightness without compromising the lifetime. In addition to the so-called Ason-Stack, the company also uses a unique diffuse reflector. Ason says that their technology will allow them to produce relatively affordable and efficient high-brightness OLEDs, which will also feature a longer lifetime and larger size compared to traditional OLED as well as no-angle dependency. Ason is currently producing OLED lighting panels in a pilot line, with an annual capacity of about 6,000 panels. Those sample panels are 72x72 mm, 150x150 mm and 200x200 mm in size, and offer a brightness of 5,000 cd/m2, a high CRI (over 90) and a lifetime of 10,000 hours (at maximum brightness). 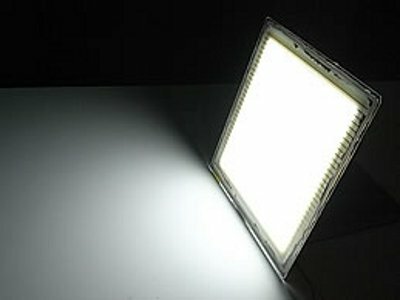 The company says that currently the price of their panels is cheaper than Lumiotec and Philips panels - even though the panels are brighter and offer a higher CRI. The company is developing new production equipment that will enable them to reach an annual capacity of 360,000 panels. It's likely that they will outsource the production to another company though. The new equipment will also enable Ason to produce better performing panels, and will enable a stack of 10 emitting layers. In addition to the new structure, Ason will adopt phosphorescent materials, and altogether they will increase the efficiency from 30 lm/W today to 90 lm/W. The CRI will be increased to over 95 and the lifetime to 20,000 hours. The production costs will be slashed by 90%.